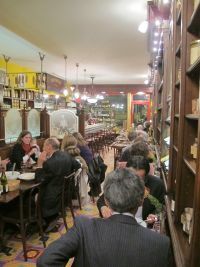 I just had the best back-to-back dining experience since I've been in Paris. Yes, I've eaten at a lot of very good food since I arrived last year, but you don't get great one's each and every time, and they're definitely not always sequential. There are highs and lows. This week, I'm on a high. It started with my reservation for Septime Wednesday night. I've been wanting to eat at this critically acclaimed bistro for months, but haven't been able to get in. I finally just asked for the next available table and then I waited, for 6 weeks. I was literally the first one to arrive at 7:25 for a 7:30 reservation. There was not one person seated in the restaurant and the staff looked at me like I showed up at Noon. They said they weren't ready for me, but that I could wait at the bar, and that was fine by me because I could watch them set-up while enjoying a lovely glass of white burgundy. Soon enough, my friends arrived, and they sat us down at a rustic wood table, next to the wine cellar. Good choice. There are no menus. They started by asking if there's anything we don't eat, and then the fun begins. Our first dish was a great collection of shellfish - oysters, mussels, clams, you name it, and it was beautiful arranged with a light vinaigrette and coconut ice on top. The next dish was a pillowy soft poached egg, sitting in a sea of foam with crunchy, cooked bacon on top. It was the best ham and eggs I've ever had. Next was a wonderful white fish with bone marrow, shaved cauliflower on top with a few other suprise tastes thrown in to bring the dish together. We then had our first showing of some meat with a luscious lamb and braised artichokes. The finale came with a warm pear in a most unusal, but wonderful hibiscus sauce and a dollop of fromage blanc. It was a fabulous meal and decently priced for the caliber - 55 euro for 5 courses. I hope to return to if I can continue to have the patience to wait for the availability. 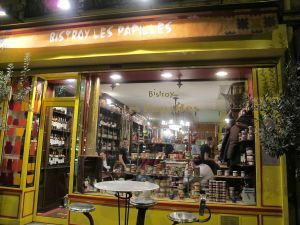 The next night I went with a few new foodie friends to Bistroy Les Papille in the 5th. This bistro is part epicerie, part wine shop, and big part, fabulous, casual bistro. It was again, no menu. The waiter shows up and tells you what you'll be eating that night, and most is served family style. We started with an endive soup. As if that wasn't unique enough, it had other ingredients I've never seen in a soup like blue cheese, which added a nice saltiness to the ham that was already in there as well. Each bite was a new flavor and new discovery. We then had the most beautiful dish placed in front of us with a crispy white fish sitting on a bed of soft, buttery potatoes with marble sized, fresh capers. It was wonderful. We then each got a lovely piece of chevre with an olive tapenade to one side and a piment d'espelette to other. It spread perfectly on your fork or a piece of bread. Dessert was a creamy, rich chocolate mouse with a frothy, salted caramel sauce on top. It was beyond divine. We also had an earthy 2004 white Burgundy that was a great companion to all the wonderful food. 4 courses for 31 euro is quite the steal for the quality and expertise of this food in a fun spot. I should quit while I'm ahead, but alas, I cannot. I can only hope to continue to have this level of cooking many more back to back days of the year!